Yeah I have another card to add to my "Men's" basket. Hopefully in a month or two I will have enough cards completed so I won't have to make a masculine card at the last minute...I'll be able to search through my basket and pick one out. Flourishes stamps were used for this image which was colored with Copic markers. The rope image was stamped twice then fussy cut, Stickles were added to the water and the decorative edging is from a Paper Studio punch. 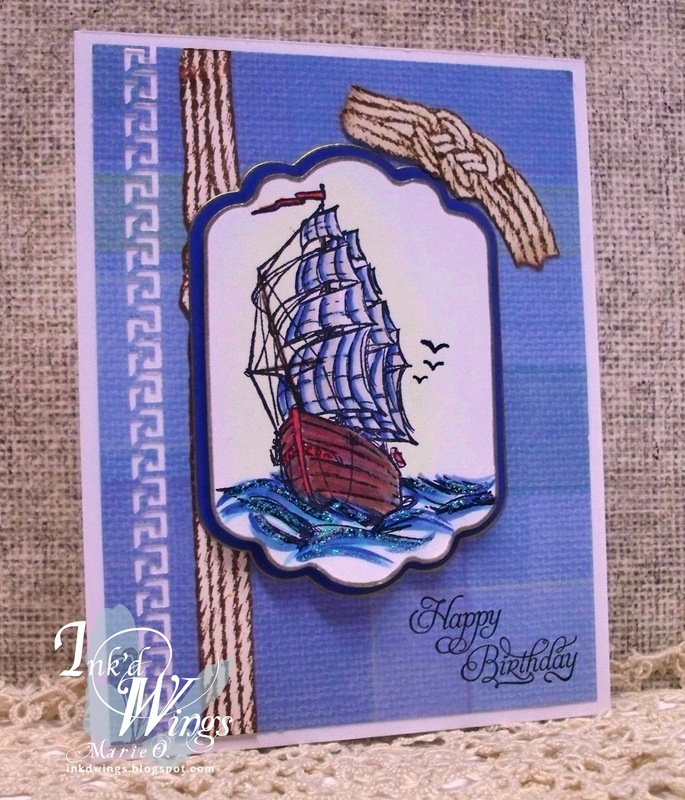 That is a great masculine card, thank you for joining us at Sweet Stampin' this week. Just beautiful. The ship is so gorgeous. You colored it so brilliantly. Great male card. The image is fab. thanks for joining us at Dream Valley. This is wonderful. Love the ship image and your coloring. The knot is the perfect touch, too.